Let me begin by saying this: AMAZING! Why? 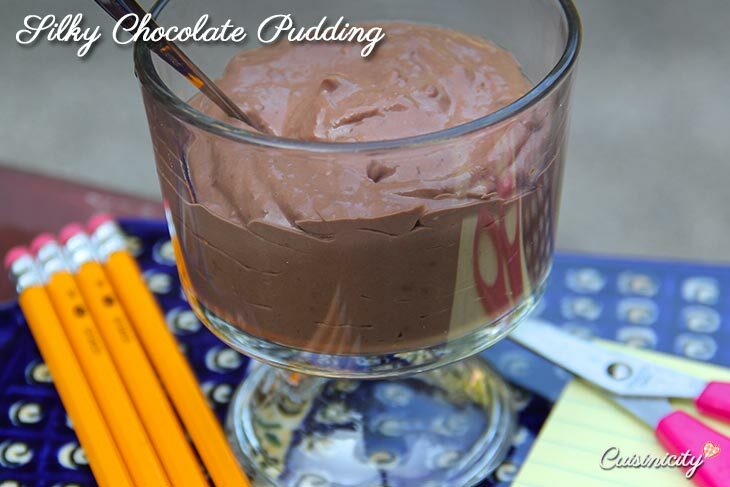 …Because although this chocolate pudding tastes luscious and creamy enough to be an elegant dessert, I actually created it as a quick-no-cook-just mix-in-your-blender after-school power snack for the kids! I use organic silken soft tofu as my base, and even add pureed black lentils and plain unsweetened soy milk to the mixture so that it is filled with plant-based protein. I sweeten it with dates (you don’t taste them!) and bittersweet chocolate–that’s it–no other added sugar! This vegan gem is absolutely delightful and kids have no idea, whatsoever, that it is good for them. Do not be put off by the initial “gloopy-curdled” look of the tofu, that will completely disappear with the thorough beating–I promise–you won’t even know it’s there!! So, make a batch and divide it up in little tupperware containers for the week to put in their lunch box. The kids will LOVE it and, of course it will LOVE them back! P.S. 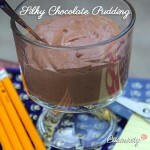 Watch my cooking class video on how to make my Silky Chocolate Pudding! *Cuisinicity Tip: I like to use canned organic lentils, well rinsed and drained, so it's one less thing to make--Below are brands I like, but it's simple enough to cook your lentils from scratch and keep them in an airtight container in fridge when you need them. Place the chocolate chips in a small microwavable measuring cup and heat in microwave on high for 1-2 minutes max, to melt; stir well until smooth and proceed. Place all the ingredients in the order above in a blender (soy milk first, then dates...that's important so the dates are completely ground this way!) and process for 2-3 minutes until smooth.Note: if you can't find the really moist medjool dates, soak them in 1 Tbsp water and microwave for 5 seconds on high to soften them. Scrape the sides and process again for another minute. Pour in little containers and enjoy at room temperature or store in fridge. Here are brands of canned lentils I like: Organic Black Lentils— you can also find them (click here) at Target, of all places!! You can also dress it up with a drizzle of dark chocolate for a fancy “grown-up” dessert! 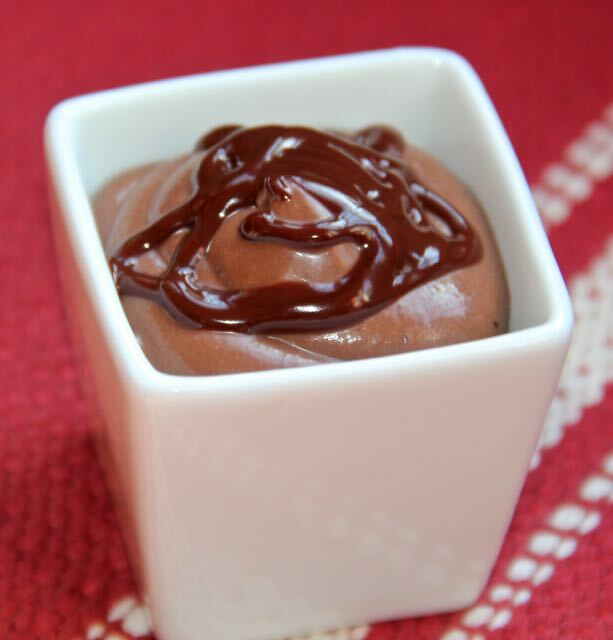 I also recommend my petits pots de Crème au Chocolat: WOW!! I wonder how it would work with coconut milk, (which would be my preference over soy for GMO reasons and the extra medium chain triglycerides) ? Thank you Catherine for the information. I also followed the other links offered and am satisfied with the evidence for the benefits of organic or non GMO soy whole food products. I also appreciate you showing what brand you approve of. Now I will have to try your recipe as is! ? All ready to try this one – but I’m in England where the choice is not silken or firm or other tofu but rather tofu, at least at my local store. How do you suppose this would work with likely firmer tofu if silken tofu isn’t available? Is there any way to change the ingredients to compensate for that – or should I just keep looking for the silken version? Dearest Catherine, this was another winner! Even my guests from France loved it and when I revealed the ingredients they were totally bewildered 🙂 Everyone loved it, well except my son who is not into chocolate (!!!!) I LOVE how nutritious this dessert is. Do you think that the chocolate could be substituted for let’s say strawberry purée??? Or do you have any ideas how another flavor could be worked in? Thank you so much!!! Thank you so much!!! Strawbery purée? Mango purée? I have full trust you can create another perfect flavor besides chocolate! Can’t wait to hear! Thank you again! Perfect frozen in popsickle forms too ? My little oe kept asking for ice cream. With this version I can indulge her. One advantage for parents is, they do not drip. My husbands remark was it tastes more lucious and yummy then most mouse au chocolate! You say it is healthy?! Hi Sibylle! It doesn’t get better than yummy yum!!!! I love it! It is indeed healthy, however because I know your little one also loves my chocolate banana milkshake in the morning, I wouldn’t want her to overdo with the chocolate! I am sure you are on top of it but if you’d like some more kid-friendly simple dishes for her, I have quite a few here: http://cuisinicity.com/stealth-mom/ Enjoy! Thank you Cathrine! I will definetly try some of those for her. She stopped eating meat balls a few weeks ago – maybe yours get her back on it. Oh and she still loves her pan cakes: inspired by some of your other recipes, I incorporate chickpea flour and some almond flour in my whole wheat pancakes. So if I add some blueberries it is a whole meal. You are so cute Sibylle! I love your determination! Please let me know how she likes (loves?) them when she tries!!! Thanks for putting together such a healthy dessert! I’ve made this pudding twice now with varying success. The first time I had to use firm tofu and cow’s milk and, although it tasted fine, it had the consistency of modeling clay. Amazingly, my family still ate it! The second time I got everything right with the exception of using almond milk instead of soy milk (just a mistake on my part when I was at the store). The consistency is much improved and it still tastes great, although its a little grainy despite blending for 3 minutes. Do you have a suggestion for getting everything blended just right? Would warming the ingredients help? Thanks Laura! I actually don’t have any trouble getting it to be very creamy with the ingredients that I specify in the recipe, so maybe substituting almond for soy milk milk makes a difference! I have made it before with firmer tofu as well but certainly didn’t add any milk, and that too was fine. So, I would recommend trying it one more time (!) with the exact ingredients that I call for, and also to put it in the blender in the order I recommend so that the medjool dates get blended thoroughly. If you watch the little video clip of the recipe, you’ll see that I didn’t have to blend it very long at all so I can’t wait to hear if that fixes everything for you! It should! Thanks for your suggestions. I have always used the specified order and I continued to use almond milk, but now I have success! It seems the keys for me are to melt the chocolate completely and steaming the dates before adding them to the mix. By microwaving the dates with a tablespoon of water, they get soft and blend nicely with the other ingredients – no more grittiness! Hi Laura! I love that tip! I will add it to my recipe as a PS for those who can’t find the really moist medjool dates. Such a clever idea! Thank you so much! May I ask why you refer to use the almond milk? Are you allergic to soy? I’m glad to hear that the tip about the dates is valuable. I use almond milk because we have it – nothing against soy milk at all! Thanks again for the recipe – it really is my (picky eater) son’s favorite dessert! OH MY GOODNESS YAY!!!!!! Laura, I especially love to hear that about your picky eater!!!! I’m going to give this 5 hearts, even though I have not made it yet. I have tofu & dates left from making the Choc. Custards. I just bought some black lentils, (not canned, I have to cook) all I need now is soy milk. I KNOW this will be awesome!! This weekends dessert!! YAY!!!! Tracey!!! Thank you, what a sweetie!!! 5 hearts back at you!